Once the walls have reached the relevant height it's time to top off with the roof and begin to get the build watertight, so that work can go on inside the extension, something that's crucial with the unpredictable nature of the weather in the United Kingdom. Having said that, note that it's usual to put the doors and windows in after the roof, but that's a relatively quick job once the roof is on. The process will depend on the type of roof that is being put on the extension, but they will all demand that the walls and other supporting structures are able to take the weight the roof that is going to be erected. The vast majority of extensions roofs will be either pitched, with tiles of one kind or another, or flat, with a waterproof membrane. How to choose between them and some of the other alternatives is covered in our article on roofs in our 'Extension Options' section. Of course the weight of a flat roof will be a lot less than that of a pitched roof. The materials are lighter in the first place, and the area to cover is a lot less, sometimes as little as half the area of a pitched roof. This means that the supporting beams can be probably be laid across the walls with little in the way of extra support as long as the span isn’t too great. A timber 'deck' is then laid across the supporting steel or timber and the waterproof layer applied on top of the deck. The deck can be of concrete too, although this will need more support. Its worth noting that the previous habit of putting insulation below the deck is now frowned upon in England and Wales and actually outlawed in Scotland. Insulation must now be laid on top of the decking and below the waterproof layer. A pitched roof will usually have a timber frame to which battens and then tiles are added. Constructing the frame on site may be necessary for an unusually shaped extension but it's a lot cheaper if you can get pre-constructed A-frames delivered and erected on site. This will also be a lot faster, meaning the building will be weatherproof that much sooner. Once the A-frames are in place the additional in-filling timbers or steel members can be added. These brace the trusses together and provide the support for the roof covering. The various purlins, spars, collar ties and hip and valley trees needed for the size and shape of the roof really need to be calculated by an expert to make sure they can take the weight of the roof and the battering of the weather. When all the intermediate support is in place a layer of waterproof underlay sheeting (solid boarding in Scotland) is laid down, and the battens that the tiles or slates will be nailed to are put in place. 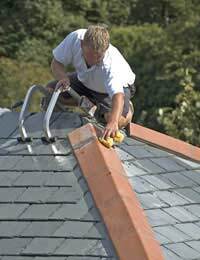 Once the tiles or slates have been attached its important to make sure that adequate ventilation has been left at the eaves to prevent condensation build up and associated damp problems. It should go without saying that if you are at all uneasy about building the right structure to support your roof, regardless of which type you have chosen, then get the professionals in. It's not worth scrimping on this as it's your family that could be at risk if the construction is not up to scratch.